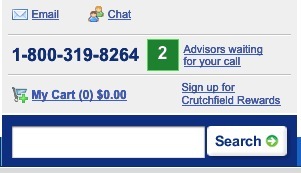 I recently called the Crutchfield (www.crutchfield.com) customer support line at 1-800-319-8264 and had an amazing experience. There are some really interesting things Crutchfield is doing in the their call center, other retailers should take notice. BACKGROUND: I was looking to replace an existing surround sound system with a new receiver with HDMI switching to support some new devices. I wondered if my existing speakers could be used so I checked the impedance and found they run on 4 ohms but the receiver I was looking at was only stable from 8+ ohms. I wanted to check into some creative wiring techniques to increase the impedance to 8 ohms so I decided I would give Crutchfield a call. I noticed in the header of the site the call center number was changing based on my location on the site – I am guessing to send me to the correct department. The unique aspect was a indication of the number of representatives available to answer my call. I noticed this number was changing in real time (assuming AJAX) so my expectation was set that an actual human would eventually answer. When I noticed a few agents were available I called. I was surprised when after 2 rings an agent answered. I started by telling them I needed to speak to someone about home audio – I assumed I would be transferred. Instead the agent said, “What do you need to know”. I then told him the model of my existing system (I have had it for ~4 years) and he was familiar with it and had all the answers right away. AWESOME! At this point I was impressed with the service and had developed some trust with this agent (he obviously knew what he was talking about). We had determined that my existing system would need a major overhaul to work as desired so I asked for suggestions on replacing the whole system. As expected he had lots of suggestions but this is where a feature I have not seen previously came into play. After refresh I was on the product detail page for the item he wanted me to see. WOW! This sounds pretty easy conceptually but would get complicated with a clustered environment and lots of active sessions. What do you think? I have a feeling we might see this feature popping up around the web soon. I might even make a Magento Extension for this session control feature. Let me know if you would be interested in using this extension. Thanks for the thoughtful post Nick. Glad to hear you had such a good experience. We’re all about making it simpler for our customers and our employees to communicate clearly. Thanks Chris – I can tell you guys are working hard at making the experience great. My personal experience was well worth the post, I guess I am sort of a brand advocate. We would love a Magento Enterprise extension for this!